Is Carmine Used In Your Mineral Makeup Or Lip Colors? Carmine is not a colorant we choose to use to achieve our red or pink shades in our mineral makeup products or lipsticks. Only iron oxides are used to achieve our lovely mineral makeup foundations, bronzer, blush, eye shadows and lip colors. The truth is, the origin of this shade comes from the Cochineal beetle which is crushed to create the vivid red color that we find in Popsicles, gelatin, fruit drinks, cosmetics, processed foods, lollipops, etc. It is essentially a safe color and has been used for centuries to achieve a vibrant red, and came on the scene in popularity to replace coal tar dyes (Red Dye #40) due to their link to cancers. However, if you also think of this colorant as totally 'icky' and don’t particularly want crushed beetle on your face, which could happen if you are using other brands of mineral makeup or lip colors, then this would still not be a preferred pigment regardless of it's popularity. It is typically labeled on packaging as "artificial color added" or "cochineal dye" or "E120" or "carmine". Unfortunately, labeling without exact clarity of the ingredient is irresponsible since some people can have a severe reaction to this insect such as allergies, asthma attack or anaphylaxis. There are those that are concerned who are lobbying the FDA to make it a requirement for food companies to fully disclose the source of the color so a choice can be reached by the consumer to eliminate it from their lives, not just for safety reasons, but it is also not considered Kosher for some religions. Vegans especially don’t want any product on their skin that possesses this colorant, much less eat it. 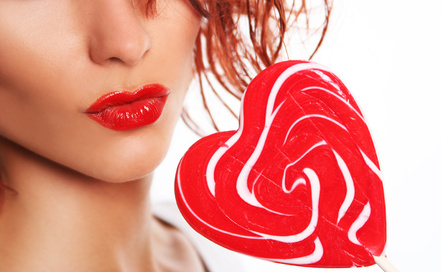 Bet next time you go to buy a bag of lollipops, fruit juice or your favorite jello, you'll take a peek at that label for the mysterious pigment known as Carmine. Frankly, we feel the thought of smearing insect on our skin or lips is just plain creepy, so you will never find this ingredient in our mineral makeup products or lip colors.